Looking at the Left has a report on the manufactured Organizing for America rally in Denver on Friday. The democrats handed out pre-painted signs and duped attendees into signing pro-Obamcare petitions. The Obamacare organizers bussed in their union supporters for the Raleigh town hall meeting. Conservative Nation has a report on the astroturfed rally with bus pictures. 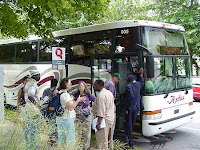 Hey democrats… Who’s paying for the busses? Meanwhile… 6,000 non-astroturfed Tea Party protesters rallied in Sacramento this week. And, 2,800 came out for tea in Williamsport, PA yesterday (population 30K).